Troy has been rock climbing since 2006 and, and he began route setting as a volunteer shortly after that. 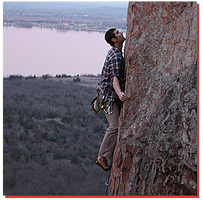 His favorite place to rock climb is Arkansas in the fall. He also enjoy making utilitarian pottery, and teaching ceramics at Mark Arts. He like mountain biking, kayaking, white water rafting, fishing, camping, board games, local restaurants, and ping pong. He like Wes Anderson movies, and I like to listen to classic country music. His pet peeves include: littering, playing music with one's phone speaker, and bad finishing holds on routes.